Dorm room decorating for the holidays is important to making your college dorm room feel like a little home away from home. Holiday decorations like dorm Christmas trees make a college dorm room extra comfortable. Of course you don't want to have a bare college Christmas Tree in your college dorm room! When you're adding holiday decorations to your dorm Christmas tree, don't forget about the garland! Garland makes your college Christmas tree fuller and adds to dorm room decor even more. For a bright pop of color on your dorm Christmas tree, add dorm essentials like our Hot Pink Garland with Mini Lights! 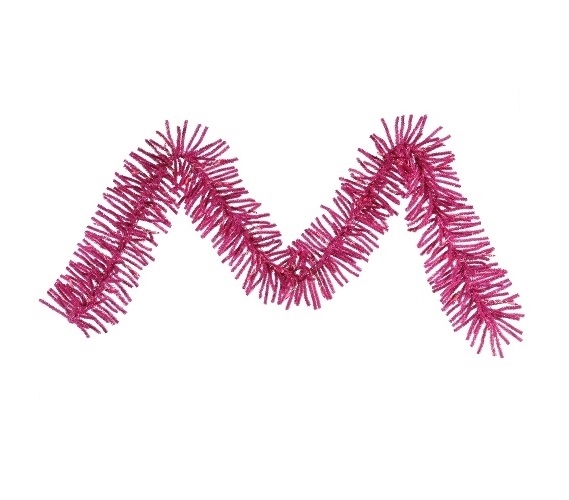 Our Hot Pink Garland with Mini Lights has a bright pink color with clear mini dorm lights mixed in with the strand. With this dorm necessities item, you'll have two dorm items you need for your dorm room decorating in one college supplies item. You aren't only limited to placing this dorm essentials item on your college Christmas tree, either. For a complete dorm room decor style for the holidays, you can artistically wrap this college supplies item around your dorm dresser or dorm desk!